Contact us if you would like to become a member of our section or if you have questions about anything. Our Section has an active community for its younger members and student members. Our Younger Member's Group is for members of our section 35 years of age and under. You can see our home page by clicking here. For information about happenings in Olympia as they affect the civil engineering industry, visit our StateTrack webpage. The Student Chapter of ASCE at St. Martin's University in Olympia is our section's student organization. You can find their facebook page here. 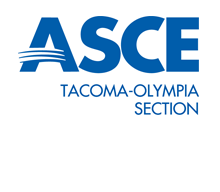 ASCE Tacoma-Olympia maintains close ties with nearby professional organizations including the Structural Engineers Assocation of Washington and the Society of American Military Engineers. We hold a joint meeting with these organizations annually.